I don't know the variety of this one, but I like it. I've got three different ones going in this area. Since I took my fence down, I've had an interesting time figuring out what to do with all the clematis I had on it. One of the others is Jackmanii, and I'll just have to wait and see what the third one is. Very pretty! I have a white Clem that blooms in spring. It is just about done. I was told once that it was Henryi. Not 100% certain though. Wow, those Clematis blooms are HUGE! The whole plot there is looking quite nice. 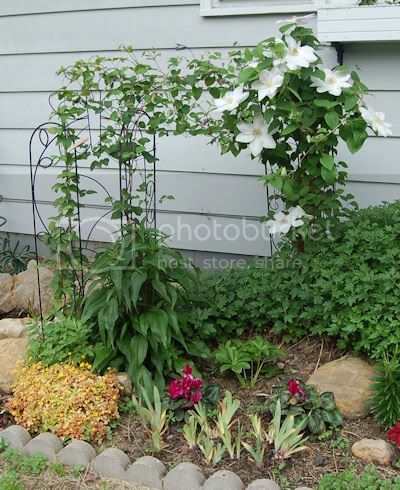 That is one of the largest white Clematis' that I have ever seen. I wonder what the other one will look like.